Jaime Oliver has been in Huntington filming a show about how fat we are. Yesterday was the final day of filming. On Thursday of last week he filmed at Cabell Huntington Hospital. The nurse I work with, Lisa, and I went over to the hospital to check it out. Jaime was cooking on what was called The Green Truck (http://www.greentruckonthego.com/). The whole thing was interesting to say the least. When Jaime came out, he was very unfriendly and fake. He acted annoyed by the couple of people who said hi to him. Lisa had to sign a tv waiver to be able to order. Seeing as I'm 7 months pregnant, I have no desire for all of this to be on national tv. I did, however, stand in line with Lisa for some of the time. 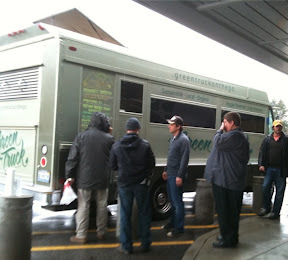 The fumes from the "Green Truck" made me sick. It may run on old cooking grease, but there were plenty of fumes. Not sure how that's good for the environment. The production assistants moved everyone inside before taping started. They said for them to act busy and Jaime would come in and lead them outside. I was totally shocked by how produced and ridiculous the whole thing was. Mom and I were in the fountain scene in "We Are Marshall" and it wasn't even this fake! So much for reality tv. Then they moved outside to the truck. The truck served a salad, bison burgers and bison hotdogs, and chilli. Lisa was in line for 40 minutes. She said the salad she got was really good. Jaime acted annoyed to interact with people in line. After about 10-15 minutes of shooting he moved inside to cook. The whole thing was very eye opening. The best part of the whole thing for me was the guy who actually ran the truck. Had he not been a short hippie in need of a bath, he could have been an actor or model. Then again, the truck is from LA, so maybe he's just waiting for his big break.